Creating a book is great fun, but VIA Rail keeps rolling on. VIA Rail's CANADA 150 silver sesquicentennial fleet, that is. While I update VIA developments that have occurred since 2011 in this upcoming book, CANADA 150 wrapping of P42's, F40's, Business Class and economy LRC coaches and even lounge car Glenfraser roll on. As the book went to the graphic designer, I had to draw a line in the ballast. 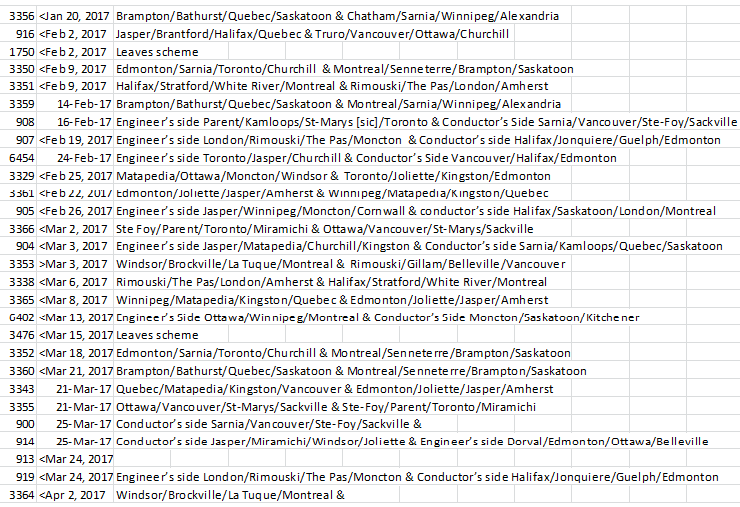 For the VIAphiles out there who keep rolling on, here is the current state of the CANADA 150 fleet as of April 3. And if you happen to see VIA 913, the engineer's side of 900 or the other side of 3364, drop me a line! I trust you'll find this information useful. 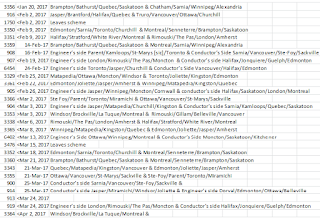 As with all other VIA information, it is tons 'o' fun to put together. St Marys Ontario is spelled correctly without the apostrophe.